A few weeks back we went along to one of Newcastle’s most popular restaurants, Vanilla. 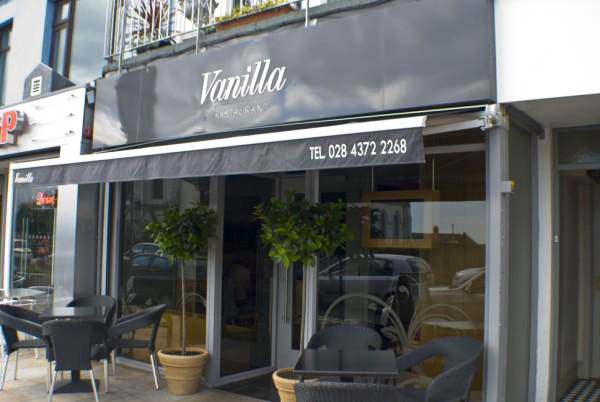 Owned and run by award winning chef Darren Ireland, Vanilla offers a great lunch menu at a reasonable price. We’ve been a few times before and have always been very impressed, although we have never ventured in for a spot of lunch. With a lunchtime special deal on 2 courses, we decided that a main and dessert was the only way to go. Visiting Vanilla for a spot of lunch offers a relaxing and enjoyable dining experience, that is topped of with some excellent food. We decided to go for the 2 course lunchtime meal option which cost £15.95. 3 courses are available for £19.95. Here’s a review of what we enjoyed at Vanilla. Although this wasn’t really a main course size dish, it was the perfect size for a two course lunch. 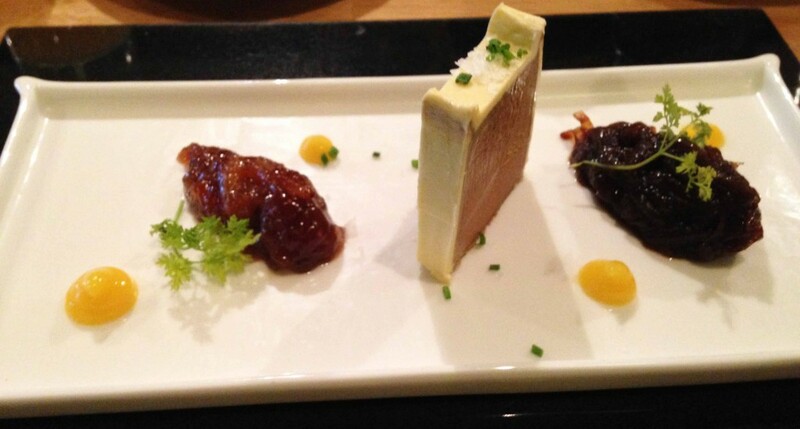 The liver parfait was smooth and light and accompanied with a spiced bramley and sultan chutney and onion marmalade. The spiced bramely chutney had some orange flavour running through it which complemented the liver perfectly. The liver parfait was also served with a delicious toasted brioche, which added texture and additional sweetness to the dish. Overall it was a tasty meal and something we will certainly look forward to enjoying again. This dish was accompanied with a mild curry risotto and was a wonderful plate of food. As a fan of duck, chorizo and curry, this was always going to be a winner, and it certainly lived up to expectations. The scotch egg was cooked perfectly, with the yolk oozing from the centre, to add another dimension to the dish. 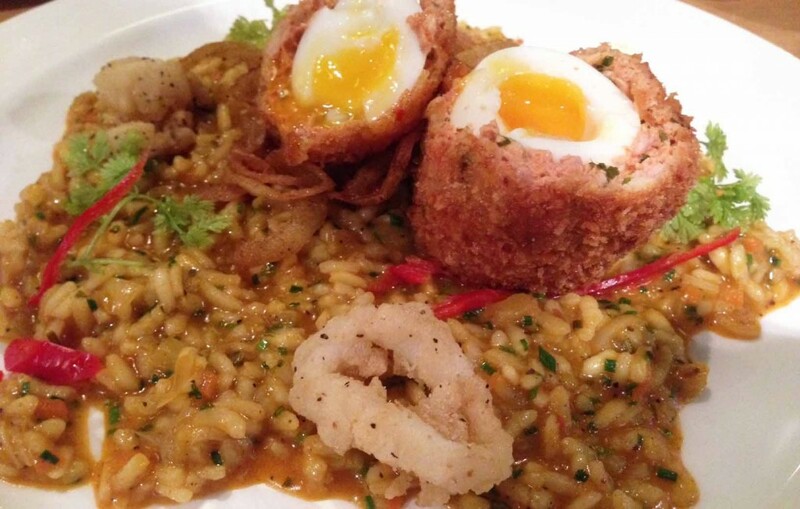 We enjoyed this dish so much that it was the inspiration behind our own scotch egg and curried risotto recipe, which you can see here. 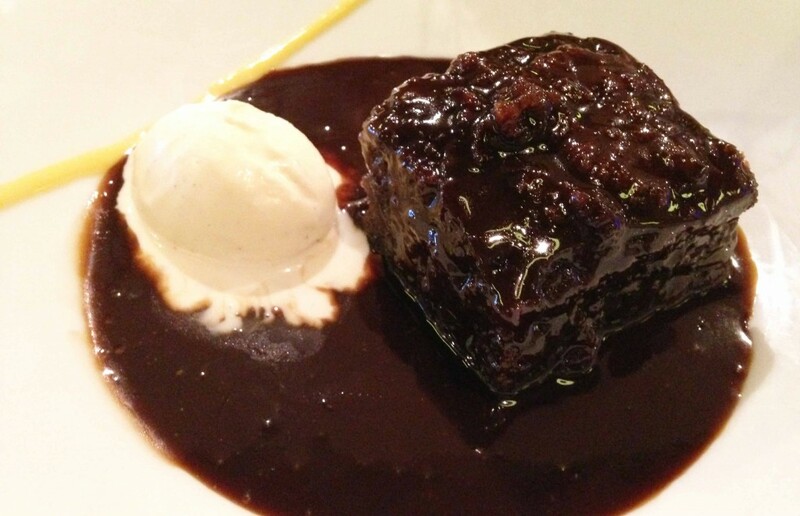 We’re big sweet fans here at Pikalily, especially when it comes to sticky toffee pudding. This is a dessert we regularly enjoy making at home so it’s always nice to sample this when dining out. This sticky toffee pudding didn’t disappoint and was very indulgent and rich, and extremely treacly – this may not be to everyone’s liking. There was plenty of sticky toffee sauce which is always a bonus and the brown bread ice cream was beautifully delicate, although we could have done with a bit more of it. This was hands down one of the nicest desserts we have ever had. 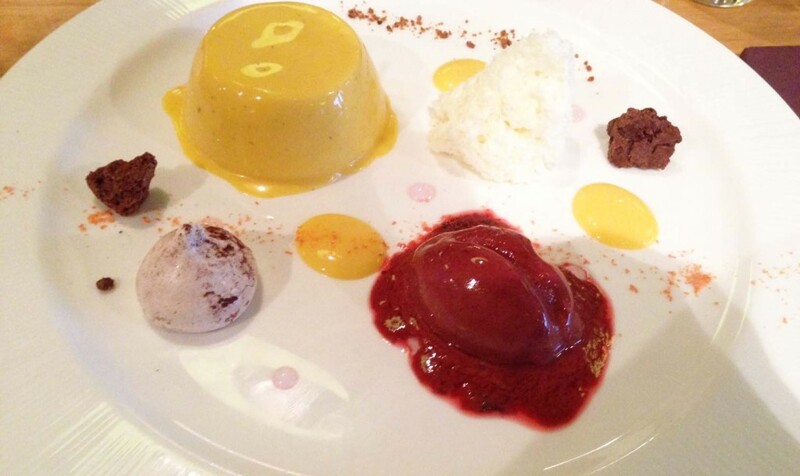 The fragrant mango panna cotta was an explosion of flavour with every mouthful. It was accompanied by a balsamic and raspberry sorbet, and a white chocolate and orange aero. When combined with the panna cotta this was like one big party in your mouth. Certainly a dessert we’ll be ordering again. We enjoyed a soft drink and latte with these meals, meaning a final bill of just under £35, an extremely affordable bill for a 2 course meal for two, we’re sure you’ll agree. Have you ever been to Vanilla Restaurant, Newcastle for lunch or dinner? If so, we’d love to hear your thoughts on the food and the service. We were extremely impressed with both. Let us know by commenting below or connecting with us on Facebook and Twitter. Vanilla is ranked as the number 1 restaurant in Newcastle by TripAdvisor. Check out all their TripAdvisor reviews here.